Things are starting to heat up in the windy city by the Caspian Sea. The theme art and the slogan for the contest were presented a few days ago in conjunction with the host city insignia exchange ceremony, as well as the semi-final allocation draw. And we suppose that’s something. 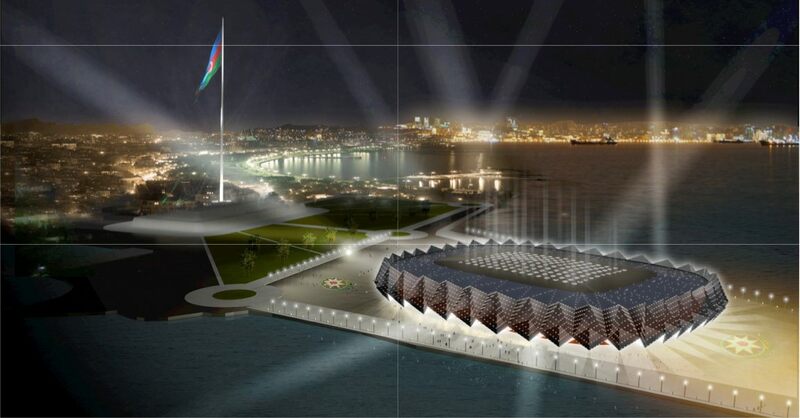 The EBU has even approved Baku Crystal Hall as the Eurovision 2012 venue. A couple of months back we would have laughed at the person who said that would actually happen, and it’s still just a big, messy construction site! How is finalizing the venue in time even possible? Oh, we forgot, just demolish a few apartment blocks and throw people on the streets and it’s all easypeasy. And even though the EBU Event Supervisor Sietse Bakker during a press conference in Baku earlier this week claimed that the demolitions referred to are apparently related to the construction of a road, and are “not related to the construction of the Baku Crystal Hall”, it still sort of doesn’t make it OK to do such a thing to your own inhabitants. Nor is killing stray dogs on the streets of Baku to make the city more presentable to visitors. Congratulations on so far being accused of breaking both human and animal rights! And as the fans are still waiting for more information about tickets for the shows, how to secure affordable accommodation in Baku and perhaps most importantly, how to obtain a visa without the agony of spending way too much time and money, chances are there won’t be that many fans ending up actually going in May. That kinda blows. And it’s against Azerbaijan’s intentions of winning the contest to begin with to bring press, bloggers and fans from all across the world to Baku. But enough moaning, we get the feeling that everything will be sorted out in the end and that the Azeris will put on a spectacular show. This year’s slogan should perhaps have been “Better late, than never” as things are moving along slowly, but tend to miraculously come into place with the speed of light at the very last minute after all. Of course the organizers went for the more boring and way too obvious Light your Fire! and we half expect the Crystal Hall to go down in a blaze of flames as a grand finale towards the end of the final show. We wouldn’t go as far as to suggest that someone should be fired for lack of creativity, but we do get all fired up when we think about the lost opportunity to present Azerbaijan in a tad more innovative manner. We didn’t like the logo at first either, but on second thought it has rather grown on us, and we now find it quite good. As semeiologists we love to go below the surface and find the hidden symbols and connotations behind the sign. After carefully dissecting what at first sight looks like a fiery flower with an oriental flare, we find dancing people, the Islamic symbol of the star and crescent and something that appears to resemble an F-Clef. And if we look hard enough we’re sure we will find a hidden message saying “we hate Armenia and will prosecute everyone who is stupid enough to vote for them”. OK, that’s maybe stretching Barthes’ myth theory a notch too far. But seriously, it’s all very neatly done we must say as eastern culture, history and heritage, passion, warmth, dance and music are all embedded in this simple and pretty logo. Compared to last year’s not so profound heart logo and Oslo’s dots and circles we’d say Baku is miles ahead of their predecessors in that department. Well done! All things considered, this week’s news made us optimistic about the forthcoming events in Baku. There are still stories surfacing that jab our conscience, and we have a hard time finding out how we can relate to that. But then we remember that our own country might stand for the most severe crime against humanity come May in Baku, if the Norwegian people decides to send Plumbo. Now we wouldn’t want that to happen, would we?